Excited for you! Good luck. Congratulations on following your dream and starting your harp journey. It will change your life in ways that cannot be imagined. I started on a Harpsicle too. A lap harp will give you a feel for the process, but adds some challenges, like holding the darn thing. You will know whether you want to invest in a larger harp after a few weeks of lessons with the Harpsicle. It sounds like you’ve already committed to enjoying the process of learning to play. I think that is the secret to sticking with the harp, because it may be a while before you think you sound like you are playing brilliantly. But it’s a harp, and other people will think you sound wonderful before you will😊. Good luck, and have fun!!!! Thanks for the encouragement. 🙂 I’m at a fairly transitional stage in my life right now and I want to do a lot of traveling, so I’m thinking I may stick with a harpsicle-size harp for long time. I love the idea of a harp I can carry on my shoulder, like an old troubadour. 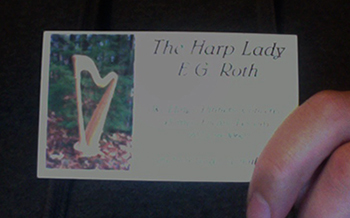 There may be a larger harp sometime in my future, though, when I have a house to put it in!